Description: The flowers are atop hairy flower clusters that are coiled like a scorpion's tail. The individual flowers are 1/2 inch (1.3 cm) wide and have 5 round lobes. The leaves are green, glandular-hairy, undivided, rounded to elongated in shape, and lobed or scalloped (crenulate). The crushed leaves smell like onions. The stems are reddish, hairy, and sticky. The similar Distant Phacelia (Phacelia distans) has divided leaves. Allergenic – Warning: The foliage can cause contact dermatitis and severe blistering in sensitive persons. 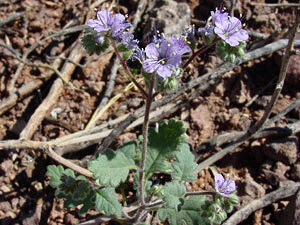 Another Phacelia species, Pedicellate Phacelia (Phacelia pedicellata) can also cause poison oak-like rashes. 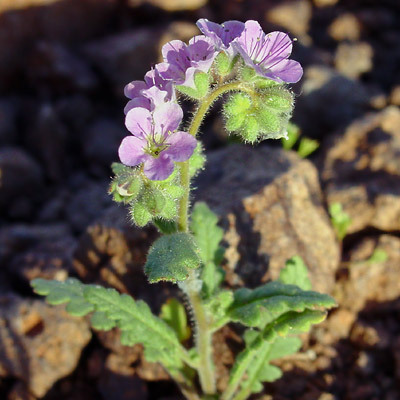 Phacelia species with sticky, glandular-hairy foliage are the main culprits. I have handled these plants without a problem, but people who are allergic to them can have severe reactions. Poisonous – The plants are not edible and can cause severe blistering in sensitive persons.